This will allow you to use Arduino code in your custom embedded project without having to use an actual Arduino board. 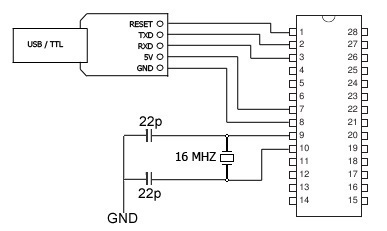 To get this chip working with Arduino IDE, you will need the 16Mhz crystal, 22pF Ceramic Capacitors that are included, and an external 5V supply, or you could use a usb to ttl converter to power the chip and upload your sketches just like you do with your arduino. Also the IC Holder is included as in the picture. If you have an Arduino you can simply place the chip microcontoller on the Arduino upload your sketch then it is ready to use. we stock a Double Side Prototype PCB Bread board ideal for this. This device is an Atmel ATmega328 microcontoller in a DIL-28 package that is pre-loaded with the Arduino UNO 16MHz bootloader. Using this device enables the use of Arduino code in a custom embedded project without having to use an actual Arduino board. To get this microcontroller working with Arduino IDE requires an external 16MHz crystal or resonator, a 5V supply, and a serial connection. The ATMega328 is an 8-bit processor. Similar to the ATmega168, with double the flash space the device has 32K of program space, 23 I/O lines, 6 of which are channels for the 10-bit ADC. Runs up to 20MHz with external crystal. The package can be programmed in circuit.